Along with AMD's launch of RX460, GIGABYTE has also announced their SKU with WINDFORCE OC edition based on the Polaris architecture. The graphic card will be available in two variants, 2GB and 4GB. Unlike AMD's RX460, the GIGABYTE Radeon RX 460 comes with dual semi-passive 80mm fans instead of a single one. GIGABYTE has not revealed the price, availibility or the base clock but we do know that it can be overclocked up to 1212MHz. Stay tuned for our reviews and futher details of the same. 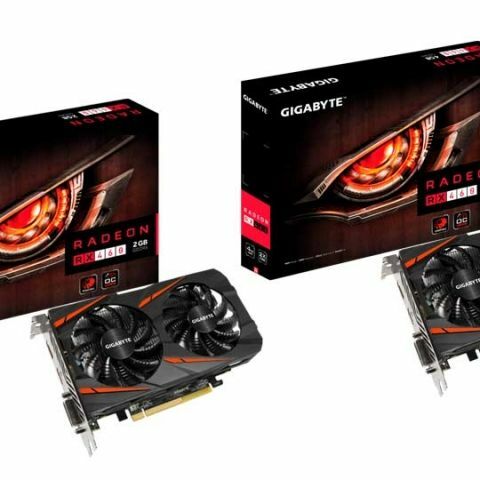 India, August 8, 2016 – GIGABYTE, the world’s leading gaming hardware brand, today announced Radeon™ RX 460 WINDFORCE OC edition graphics cards based on the latest Polaris 11 GPU with two memory variants of 4GB and 2GB models. Powered directly from the PCI Express slot, the power-efficient RX 460 graphics cards do not require auxiliary power yet come with a brilliant overclocking performance up to 1212MHz. Thanks to Polaris architecture with Ultra HD HEVC Encode and Decode, gamers could easily stream and record their favorite games with virtually no performance impact, making RX 460 an ideal upgrade solution for eSports gaming. Featuring two semi-passive 80mm fans and unique blade fan design for enhancing airflow, the WINDFORCE 2X cooling system ensures the RX 460 WINDFORCE OC run cool and virtually inaudible while delivering smooth and low-latency gaming for the most popular eSports games. The fans are regulated as they remain turned off during lighter gaming, offering a completely silent, interruption-free experience to eSports gamers whose focus and concentration are vital to their victory. The RX 460 WINDFORCE OC edition are built using Ultra Durable chokes and capacitors, making the MOSFET working at a lower temperature for more stable voltage output. Backed by a 4+1 power phase design, the cards ensure stable voltage output at a lower temperature, which translates to a better overclocking capability compared to the reference design. Via the intuitive interface of XTREME Engine utility, gamers can monitor and adjust clock speeds, voltage, and fan performance in real time according to their own preferences.